I am a problem solver. My whole career has been about solving problems. My solutions have helped develop new biomedical technologies and new products as well as solving business problems. I have had wonderful mentors, especially during the early part of my career. My best mentors taught me techniques that could be applied to many different types of problems, and I have applied these techniques to solving some problems outside of work. Good mentors in problem solving seem to be a lot scarcer these days. Meanwhile, civilization is becoming more complex, and new problems continue to emerge at an ever-increasing pace. Some of these problems threaten our health. Others threaten our safety. Some others threaten our very existence. As a result, I am now energized to teach what I have learned, so I can help develop more problem solvers. We need more problem solvers; of this I am convinced. We also need more mentors. In the case of problem solvers, the key question is: how do we get them? How do we develop them and nurture them? Perhaps it is best to start with another question: Do you wish to contribute, to the limits of your imagination, to help people and to advance your career? If so, learn how to select important problems, how to validate that they are important, and how to think about these problems and how to solve them. 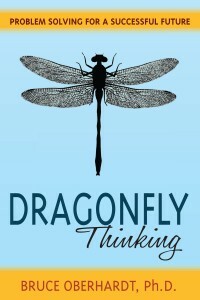 This is why I wrote my book: Dragonfly Thinking – to teach what I have learned during my career and to energize others starting out on theirs. The ability to tackle extremely difficult problems has been the key to the greatest innovations in history. Now, as more and more jobs are being threatened by rapidly-evolving technology and outsourcing, problem solving is becoming a must-have skill in order to stay competitive and valuable in today’s dynamic job market. This book is intended to help you develop superior problem solving skills – to create greater value with your work, and to advance your career. It is especially geared towards people just starting out in their careers, and towards students. Its goal is to develop much-needed problem solvers. The value of solving big problems. How to identify problems worth tackling. How to develop your problem solving skills. How to break free of ordinary patterns of thinking. How to arrive at a novel solution for extraordinary results. An important problem is one that will help your organization, society, or people in general. Solving an important problem could even save the planet. A struggle with a big problem, as difficult as it may seem, is usually the necessary step before any major success. And your next success may well be the next important advancement in your career. Advancement is not thrust upon you. You earn it by solving problems.